Emily Kumpf, a research assistant in the YR² Lab, was the recipient of a Psi Chi 2018-19 Mamie Phipps Clark Diversity Research Grant for her honors thesis, “The Relationship Between Mental Health, Treatment Utilization, and Stigma in a College Student Population.” Congratulations, Emily! A new article from the Association for Psychological Science discusses the potential application of machine learning in preventing suicide among those at high risk. Dr. Cassie Glenn is quoted highlighting the importance of such a tool, with the potential to help clinicians more accurately predict increased suicide risk. Read the full article, "Scientists Turn to Machine Learning to Save Lives". 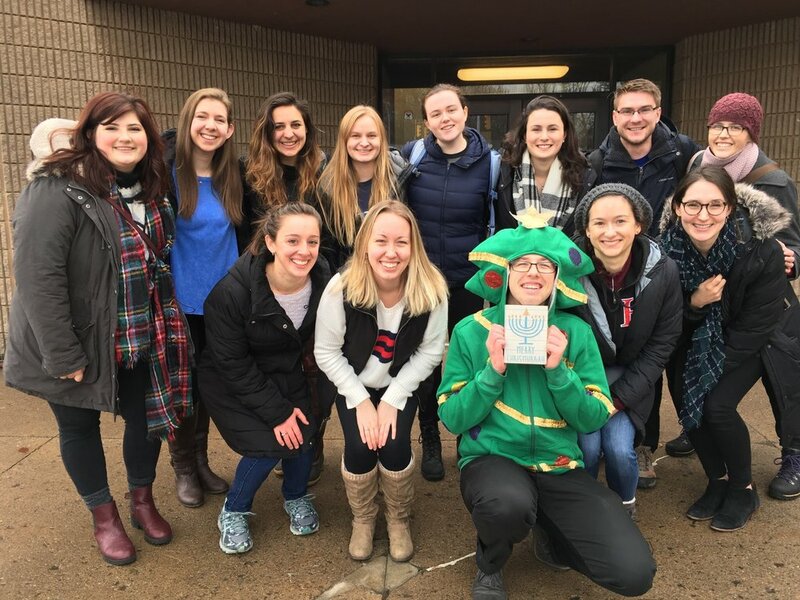 Jackie Kearns (pictured below, third from the right), a graduate student in the YR² Lab, recently presented on her 2nd-Year Project, titled “Clarifying the Nature of Attentional Bias in Suicidal Individuals.” Congratulations, Jackie! A recent article published in Science News discusses real-time monitoring for suicide research, and quotes Dr. Cassie Glenn. The article also covers one of the YR² Lab's current studies, in addition to current projects by Evan Kleinman Ph.D. (Harvard University, YR² Lab collaborator), involving real-time monitoring. Read the full article, "Phone apps are helping scientists track suicidal thoughts in real time." Drew Porter, MEd, was the recipient of the American Psychological Foundation’s 2018 The Trust Eric A. Harris, EdD, JD Grant to support his project, "Does Ecological Momentary Assessment of Suicidal Thinking have Iatrogenic Effects on Suicide Risk?" Congratulations, Drew! Emily Dudek, Anne Boatman, and Devin Robinson, three research assistants in the YR² Lab, received Discover Grants to fund their summer research working in the YR² Lab with Dr. Cassie Glenn. Lizzy Finer, another research assistant in the YR² lab, also received a Discover Grant to fund her work this summer with Dr. Martha Pitman in the Cytopathology Lab at Massachusetts General Hospital. Drew Porter, MEd, received a 2017-18 Spring Graduate Research Grant from Psi Chi to support his project, “Examining the Utility of Emotional Self-Criticism for Predicting Nonsuicidal Self-Injury, Disordered Eating, and Suicide Ideation." Congratulations, Drew! Dr. Cassie Glenn was recently named a Rising Star by the Association for Psychological Science! See the full list of 2017 APS Rising Stars here. 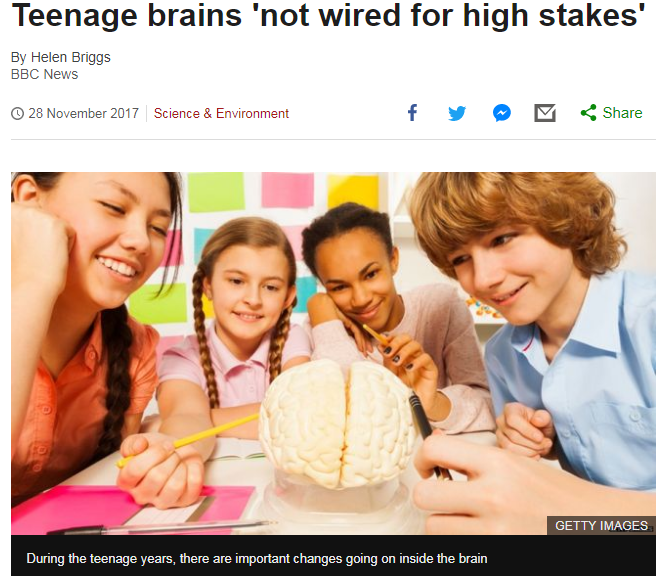 New research conducted by Katie Insel at Harvard University in collaboration with Dr. Cassie Glenn recently appeared in BBC News. Read the full study published in Nature Communications here. Drew Porter, MEd, a graduate student in the YR² Lab, presented his poster, The Differential Association of Self-Criticism and Shame-Proneness with the Presence and Frequency of Nonsuicidal Self-Injury (NSSI), at ABCT 2017. Read the full poster here. 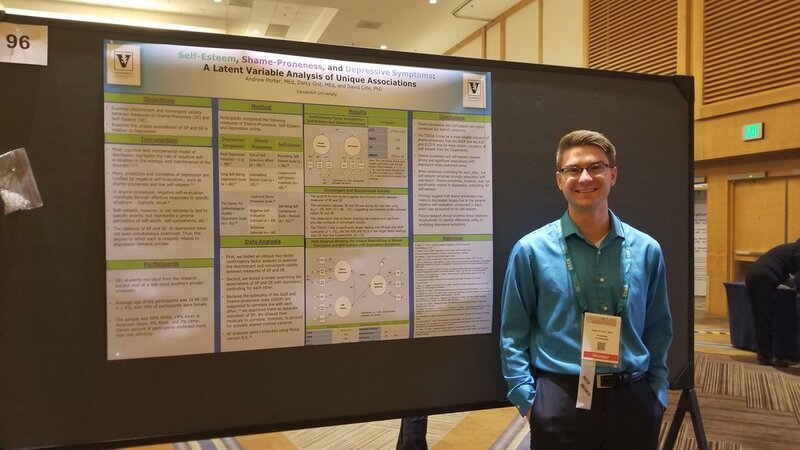 Drew Porter, MEd, a graduate student in the YR² Lab, presented his poster, Self-Esteem, Shame-Proneness, and Depressive Symptoms: A Latent Variable Analysis of Unique Associations, at ABCT 2017. Read the full poster here. Dr. Cassie Glenn chaired a symposium at IASR 2017 titled, Improving Understanding of Suicide Risk in Youth: Answering Questions of How, Who, and When, including her individual talk titled, Implicit Identification with Death Predicts Suicidal Thoughts and Behaviors in Youth. Jackie Kearns, a graduate student in the YR² Lab, presented her poster, Nightmares Prospectively Predict Suicide Attempts in an Inpatient Psychiatric Sample of Military Veterans, at IASR 2017. PDF version available here. Catherine Glenn, Ph.D. explains how testing startle response might help predict suicide risk. Read more here. Spring 2018 YR² Lab Celebration in Rochester, NY. Fall 2017 YR² Lab Celebration in Rochester, NY. YR² Lab celebrates our graduating seniors! From left: Megan Lyons, Dr. Cassie Glenn, Barbara Dioguardi Lopez. Not pictured: Christie Otto. Spring 2017 YR² Lab Celebration in Rochester, NY. Fall 2016 YR² Lab Celebration in Rochester, NY.